Since 1994, REAL-TUFF, Inc. has been owned & operated by Alain Comte of Canada and Dave Dahlberg of Clearbrook, MN. We commit to selling quality cattle equipment at a reasonable price. We also continue to make improvements due to our hands on usage, because we personally use the equipment on our own farms. Lastly, we believe we have the very best equipment on the market! Alain Comte grew up on a mixed farm near Notre-Dame-de-Lourdes, Manitoba in Canada. Al was very inventive and spent his spare time building and improving livestock handling systems that were used on his family farm. 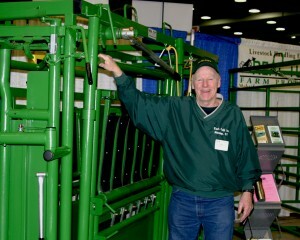 Neighbors were so impressed with Al’s equipment that they wanted it for their own farms. In 1982 a production line was set up in the farm shop which doubled in size in 1985 to meet the growing demand. 1990 brought more changes as a factory was built and since then, the company expanded 5 times. This creates more space for new machines, better equipment, and growing markets in Canada and the United States. Al understands what works and what is important in designing and manufacturing cattle equipment for every farm and ranch. Al was one of the original partners along with Dave Dahlberg from Minnesota, USA in starting the “Real Tuff, Inc.” manufacturing plant in Mobridge, South Dakota to expand business to the United States. Meanwhile, Al continues to design equipment in Canada and keeps us current with the market. Dave Dahlberg was raised on a farm near Clearbrook, MN, which is 100 miles south of the Canadian b. He earned a BA degree in biology and teaching at Bethel and Augsburg colleges in Minneapolis and St. Paul. Dave bought his first farm shortly after college near Askov, MN where he taught high school math, science and coached BB and Cross Country. Meanwhile, he ran his own cow/calf operation. Then in the late 70’s he moved back to Clearbrook and took over his dad’s insurance agency and all while continuing to run his cow/calf operation. 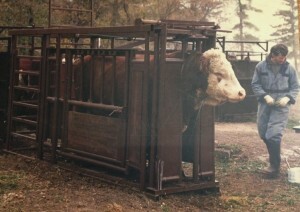 Since then, he also began selling livestock handling equipment built by Al Comte from Canada directly from his farm. Later in the 1990’s he became one of the original founders along with Al Comte of the new manufacturing plant named “Real Tuff, Inc.” in Mobridge, SD. 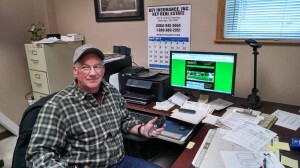 Dave loves selling cattle equipment and continues to run a 250 cow/calf operation. Our equipment proves it’s functionality, tuffness and simplicity at Dave’s cow/calf operation. This way he knows what works well and what does not so that the equipment can be tweaked as needed. In addition, Dave attends the livestock trade shows and visits with ranchers and farmers listening to their input while incorporating their great ideas too. Jerry also has ownership in the plant. He has been managing the manufacturing plant since the 1990’s. He was raised near Aberdeen, SD which is not far from our Mobridge plant. Also, Jerry plays a key role in the success of Real Tuff, Inc.!